The Irish Mesh stitch is a lace stitch without the extremely feminine characteristic which most lace patterns offer. Knitted in a multiple of 3 stitches and done in a 4-row repeat, this stitch is easy to remember and is a quick knit. The Irish Mesh stitch provides versatility which makes it great for many types of projects including scarves, blankets and more! 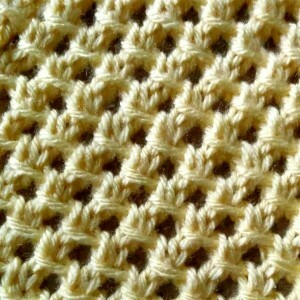 Like the Irish Mesh stitch? Check out the Irish Mesh Cowl! Row 1 (RS): k2, *yo, sl 1, k2, psso; rep from * to the last st, k1. Row 3: k1, *sl 1, k2, psso, yo; rep from * to the last 2 sts, k2. Rd 1: *yo, sl1, k2, psso; rep from * to the end. Rd 3: k2, *sl1, k2, psso, yo; rep from * to the last st, k1.